Looks like Sony PSP? What you see in this photo is the Asuka Tripper V Photo Storage Viewer! According to the company, this photo storage viewer is designed to keep and view the photos that have been captured with your camera so that you have no need to worry about memory space as well as battery life by transferring the images to this device. 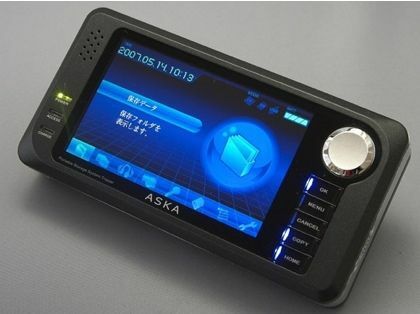 Besides, the Asuka Tripper V equipped with an 800 x 480-pixel screen display and it support the formats including JPEG, RAW, MPEG4, MP3, MP4 and ACC. The Asuka Tripper V photo storage viewer is available in variant storage size which are 80GB, 120GB and 160GB. The stylish and useful viewers are cost about $400, $570 and $660 follow by its storage size. With its huge storage, the Asuka Tripper V seems like create purposely for photographers who always make a lot of serious photoshots.